Provenance: Archduke Leopold Wilhelm (1614-1662), Governor of the Spanish Netherlands. Baron Frederick von Haagen, Berlin. John Scully, Dublin; Christie's, London, 19 July 1926, lot 152 (46 gns. to Dr. Fry). with Kleinberger Galleries, New York, 1931. Anonymous sale; American Art Association, New York, 20 April 1939, lot 35. Dr. M.I. Boas, Los Angeles. Los Angeles County Museum of Art (inv. no. 5579); Sotheby's, New York, 17 January 1986, lot 24.
with J. van Haeften, London, 1986.
with C.P.A. & G.R. Castendijk, Rotterdam, 1986. 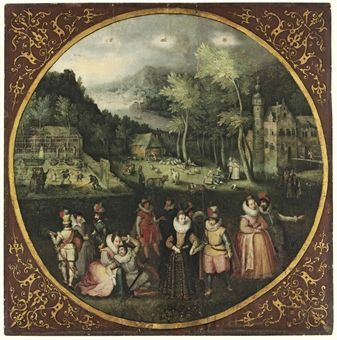 Anonymous sale; Christie's, Amsterdam, 14 May 2003, lot 189. Literature: Art News, October 1931, p. 20, illustrated, as 'Jan Davidsz. de Heem'. E. Greindl, Les Peintres Flamands de Nature Morte au XVIIe Siecle, Brussels, 1956, p. 168, as 'Jasper Geeraerts'. 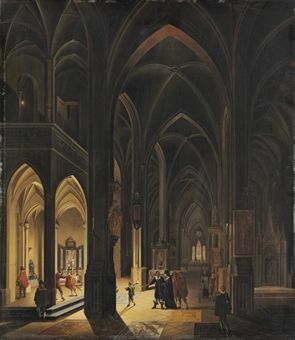 W. Bernt, The Netherlandish Painters of the Seventeenth Century, Munich, 1969, I, p. 43, no. 417, illustrated, as 'Jasper Geradi'. 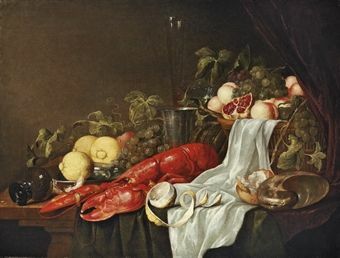 A. van der Willigen and F.G. Meijer, A Dictionary of Dutch and Flemish Still-life Painters Working in Oils, 1525-1725, Leiden, 2003, p. 88, as 'Jasper Geerards'. Exhibited: Cambridge, Massachusetts, Fogg Art Museum, 1931, as 'Jan Davidsz. de Heem'. New York, College Art Association, October-November 1931, as 'Jan Davidsz. de Heem'. Delft, Oude Kunst- en Antiekbeurs, 1986. Notes: Archduke Leopold Wilhelm (1614-1662), second son of Emperor Ferdinand II, entered Brussels as governor of the Spanish Netherlands in 1646 and resigned in 1656, when he settled in Vienna. In ten years he created one of the most important collections in Europe - the inventory of his collection made in 1659 numbered 1,397 paintings, which included paintings from the collections of King Charles I and 3rd Marquess and 1st Duke of Hamilton (1606-1649) - the ample nucleus of today's Kunsthistorisches Museum, Vienna, which he had earlier displayed in the Palais Coudenberg in Brussels.